In the 300s BC, Philip of Macedon conquered Greece. He ruled all of Greece as the king. (In theory Philip was only leading a league of Greek city-states, the first among equals. But really he acted like a king). 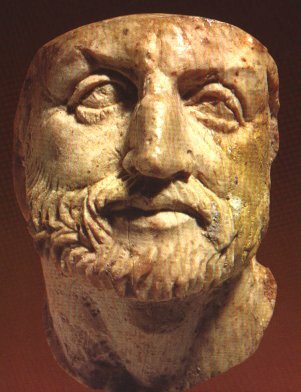 Athens and other Greek city-states still kept their local democracies or oligarchies for local government, but Philip made all the big decisions. And after Philip was killed, his son Alexander the Great made the decisions. Alexander died in 323 BC, and then Greece became a kingdom ruled by a series of Macedonian kings. The Macedonian kings let each city-state rule itself, so long as they paid taxes to the kings in Macedon, and sent soldiers to fight in the endless civil wars between rival Macedonian kings. But then the Roman Empire gradually took over Greece (and Macedon) between 200 and 146 BC. From 146 BC on, Greece was a province of the Roman Empire, and ruled by far-off emperors. Even after the Roman Empire in the West collapsed, Greece was still part of the Eastern Empire. In the 1100s and 1200s AD, the Normans conquered parts of Greece. The Normans built castles and ruled as kings. And finally, in 1453 AD, the Turks took over and established Greece as a province in their Ottoman Empire; there was not very much change in the system of government from the Roman Empire. Athenian Democracy, by A.H.M. Jones (reprinted 1986). One of the great social historians of the 20th century, though this isn’t easy going. Alternatives to Athens: Varieties of Political Organization and Community in Ancient Greece, a collection of essays edited by Roger Brock and Stephen Hodkinson (2003). Each chapter presents a different kind of Greek government: oligarchies, tyrannies, monarchies, and so on. By specialists, for specialists. Rome, the Greek World, and the East: Government, Society, and Culture in the Roman Empire, by Fergus Millar, Hannah M. Cotton, and Guy Rogers (2004). Millar is an expert on Roman government. This book deals with how the Romans governed in Greece. Ottoman Centuries, by Lord Kinross (1979). A short introduction to Ottoman government, for the non-specialist. It’s a little out of date, so it doesn’t consider the role of Islam, or the role of women, as much as it might have. Cite this page: Carr, K.E. Hellenistic and Roman government in Greece. Quatr.us Study Guides, July 6, 2017. Web. April 24, 2019.